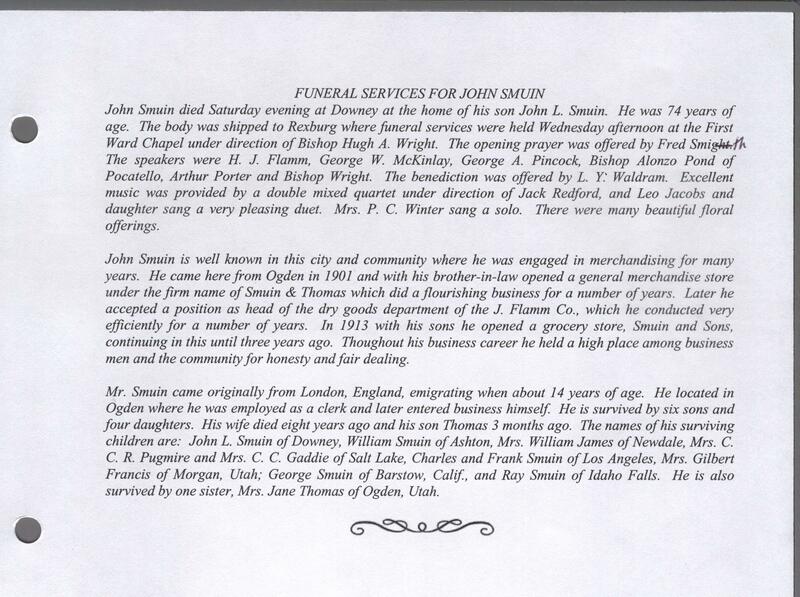 My Great Grandpa John M. Smuin died on this day 161 years ago. 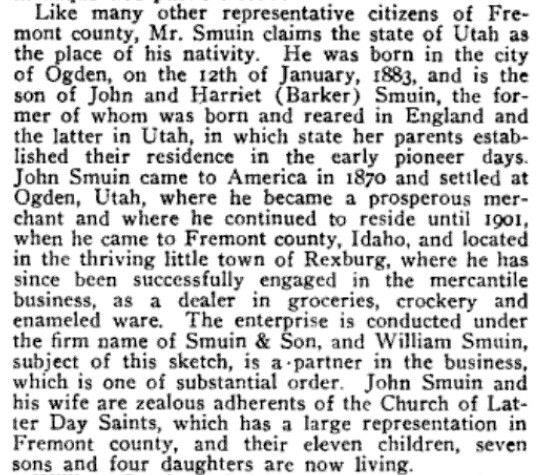 He lived in Ogden, then later had a grocery and dry goods store in Rexburg, Idaho. I don’t know much about him yet, and this photo is the only one I have of him. 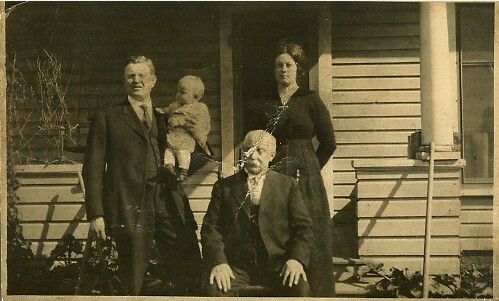 He’s seated, with his oldest son, John “Leroy” and his baby, also named LeRoy. The mother’s name is Edith (Duncan) . John’s son, Franklin, was my Grandpa, number eight of eleven children. 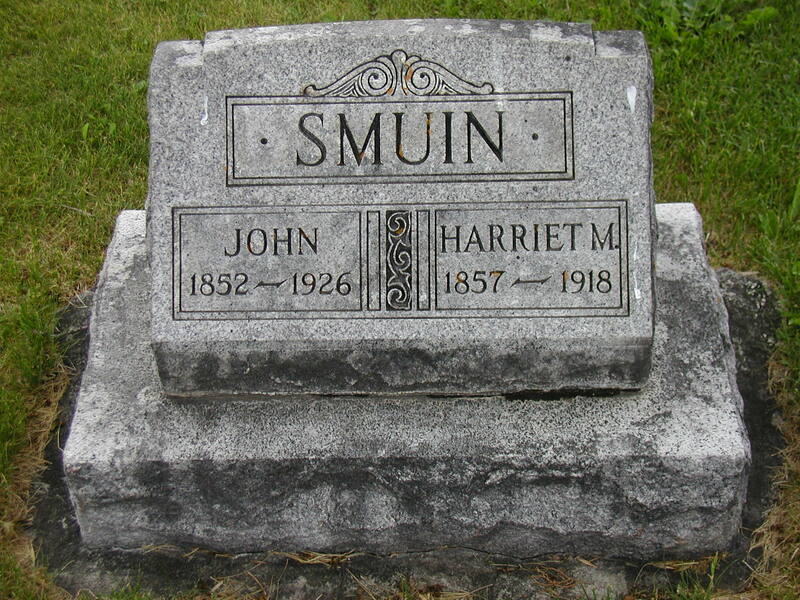 I went through Rexburg, Idaho in 2003 with the family on our way to Yellowstone and we went to the cemetery to find the headstone for John and his wife Harriet Matilda Barker Smuin. She is the daughter of Mary Ann Pain Holt. 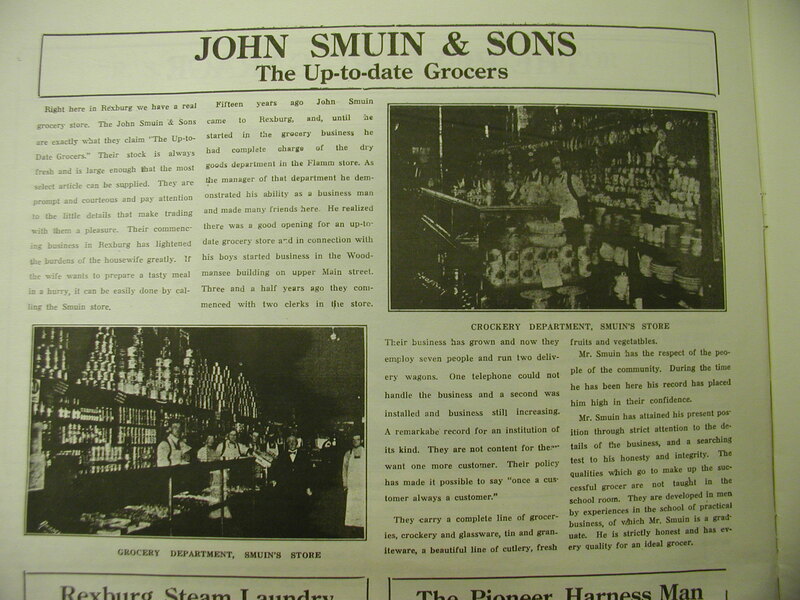 I had a one-page history about John’s life and the write up below about his funeral. It mentions several speakers, including Arthur Porter. When I showed it to the white-haired woman docent working that day at the local museum, she told me she was Arthur Porter’s daughter. She said she knew all the people mentioned here. I gave her a hug, knowing she had known my Great Grandpa. It made me feel one step closer to him. I’m happy to know what I know, but I sure wish I new more about John and Harriet. Thanks for your comments and information. My computer is still down and all of my Family History work is in that computer. I’m hoping to get it back from the shop by the end of the week. I loved reading about your family members. Where do you live? My email is annlewis@byu.net. I’ll be able to respond more completely when I get my computer back. It will be fun to share information!